Workshop on “Adolescence issues” was organized in the portals of DAV Model School Sector- 15 A, Chandigarh by Dr. Simmi Waraich, Senior Consultant (Psychiatrist) and Ms. Sumedha Banerjee, Clinical Psychologist, both from Fortis Hospital. The event started with ceremonial lamp lighting. Principal Mrs. Anuja Sharma highlighted the importance of conducting such workshops for educators to spread awareness about various strategies for coordinating behavioral problems of teenagers in a constructive manner. Dr. Simmi Waraich & Ms. Sumedha Banerjee brought forth various psychological causes and Physiological functioning of brain for different moods swings, behavioral problems, ADHD and anxiety. The session was quite interactive and many queries were discussed and analyzed. It proved to be a fruitful and instructive workshop for all present. Workshop on Protection Of Children From Sexual Offences Act. ‘To be concerned is to be human’. With this motto, a workshop was conducted on ‘ Protection of Children from Sexual Offences Act. in the portals of DAV Model School, Sector- 15A, Chandigarh by Ms. Rekha Sharma from Police DAV, Jalandhar. The event started with ceremonial Lamp lighting and DAV Gaan. Principal Mrs. Anuja Sharma highlighted the importance of conducting such workshops in the school as they are an eye opener. She emphasized that vigilance is the key to protection. It was an interactive session exhibiting many videos, slides showcasing the need to protect children. The teachers and supporting staff were fully apprised about the POCSO Act. for welfare of everyone in the school premises. One day capacity building workshop was organised by DAV regional centre for academic excellence under the agies of DAV college managing committee. DAV schools of Chandigarh Zone organised inservice need based training workshop for Hindi, Sanskrit and Science on 17th October, 2018 from 9.00a.m. to 5.00p.m. The workshop was organised under the able guidance of our worthy cluster head Ms. Jaskiran Harika. Mrs. Anuja Sharma inaugurated the workshop and in her inaugural address she stressed on the need of such workshops which equip teachers with hands on activity, performing experiments, creating models and using teaching aids that in turn strengthens the teaching skills. She addressed the teachers as true soldiers carrying their students on the path of success. After the inaugural session the attending delegates moved to their respective centre for the workshop. The interactive workshop of Hindi, Sanskrit and Science created a congenial interactive teaching environment bridging the gaps in the teaching methodologies. The need of hour is to keep the educators abreast with the latest resources so that they can use for the optimum teaching in their classes. The interactive workshop helps to disseminate the technology based learning which creates creative thinking and results in experiential learning. The vibrant and enthusiastic delegates felt empowered attending the meticulously designed workshop. One day capacity building programme on value education under the aegis of CBSE, centre of excellence was organised on25th September from 9.30 a.m. to 5.00p.m. Mrs. Sweta Singh Joint Secretary, Head Centre of excellence and Mrs. Anupama Sharma Principal M.R. DAV School were the resource persons. Mrs. Anuja Sharma, Principal DAV-15 welcomed all the delegates. The workshop commenced with illuminations of the lamp of knowledge. 67 delegates from different school participated in the enriching workshop. The workshop focused on the inculcation of values and using them as “empowering tools” to help meet the challenges of our contemporary social world. The flux of the interactive session was to address environment and value degradation multicultural conflicts and ill effects of mass media. Basic Life Support and First Aid Training Programme under the guidelines of CBSE Health and Physical Education Programme was conducted for teachers of DAV-15 Chandigarh. A special team of Doctors from Fortis Hospital conducted the programme to create medical awareness among teachers and the other staff members. They stressed on the need to harness First Aid Training. Principal Mrs. Anuja Sharma highlighted the importance of conducting such programmes to enlighten the teachers with medical training. CPR practical was under taken to show case the ways to save the life of a person during heart attack. They also gave information about various causes and remedial measures to avoid choking. Bone density test was also conducted. The training was quite useful in imparting medical practical knowledge to teachers. Capacity building workshop for Economics and Biology teachers of Senior Secondary classes was held in DAV 15 Chandigarh under the aegis DAV College Managing Committee, New Delhi to hone their teaching skills. Approximately 30 teachers from DAV Schools of Tricity wholeheartedly participated in the workshop. 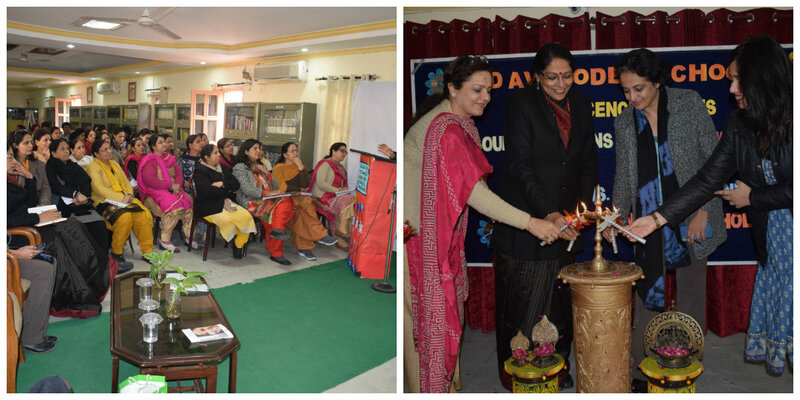 The workshop was inaugurated by Mrs Anuja Sharma Venue director Principal of DAV -15. She welcomed all present and highlighted the need to organise such training workshops to impart transfer of learning for the holistic development of students and identify their learning needs. The workshop was an interactive session in which the Master Trainers of Economics, Mrs. Khamoshi Kakkar from Hansraj Public School, sector 6 panchkula, Mrs. Archana Gaba from K.B DAV. Public School, Sector 7, Chandigarh and Master Trainers of Biology –Dr. Poonam Khurana DAV sector 15, Chandigarh and Mrs. Jatinder Kaur from DAV Phase-X Mohali imparted knowledge for Senior Secondary teachers. They apprised the teachers about content enrichment programme in Economics and Biology through micro teaching. The Master trainers of Biology showcased different techniques to equip the teachers with variety of activities for content enrichment through micro teaching, strategies and methodologies for performance enrichment and dealing with low and high achievement scale of students. They showcased diagram based learning and use of practical demonstration and digital learning resources. The Master trainers of Economics delineated the amendments prescribed by CBSE for classes XI and XII. They discussed different strategies to teach economics in a simple manner. They threw light on Transactional Strategies for making effective use of learning Logs , Analogies and Self Prepared PPTs as effective methodologies. They were also given the innovative ideas to teach Economics and Biology along with the knowledge of remedial measures to rectify the common errors. Checklist Evaluation Activities were also conducted in which the teachers wholeheartedly participated. The Cluster Head , Mrs Jaskiran Harika graced the valedictory session . She motivated the teachers to be the torch bearers . She emphasised the need to keep them abreast with latest innovations and strategies to ignite the spark of illuminating knowledge among students. The workshop opened new horizons of effective teaching. Capacity building workshop for Mathematics teachers of Primary and Secondary classes was held in DAV 15 Chandigarh to hone their teaching skills .Approximately 50 teachers from DAV Schools of Tricity wholeheartedly participated in the workshop. The workshop was inaugurated by Cluster Head, Mrs Jaskiran Harika and venue director Principal of DAV -15 Mrs Anuja Sharma. She welcomed all present and highlighted the need to organise such training workshops to impart transfer of learning for the holistic development of students. The workshop was an interactive session in which the Master Trainers Mrs. Samiksha Sharma from Hansraj Public School, sector 6 panchkula, Mrs. Pooja Aggarwal from D.A.V Surajpur, and Mr.Sandeep Kumar from K.B DAV. Public School, Sector 7 ,Chandigarh imparted knowledge for primary teachers. Mrs.Nivedita Gupta from DAV Public School, Sector 8 Chandigarh, Mrs.Rekha Vij from Hansraj Public School Panchkula and Mrs. Nishi Tejpal from DAV Model School, Sector 15 ,Chandigarh apprised the teachers about various strategies of lesson planning for teaching mathematics in secondary classes. The Master trainers showcased different techniques to equip the teachers with variety of activities for planning the lessons , mind maping , designing worksheets and developing critical appreciation of technology. Teachers learnt to comprehend , analyse, synthesis, evaluate ad make generalizations so as to solve mathematical problems. They were also given the innovative ideas to teach mathematics along with the knowledge of remedial measures to rectify the common mathematical errors. Checklist Evaluation Activities were also conducted in which the teachers wholeheartedly participated. The workshop opened new horizons of effective teaching. The State Legal Cell of DAV Model School 15A Chandigarh organised a workshop on World Mental Health day .Principal Mrs Anuja Sharma motivated the students to have a positive outlook towards life in order to ensure physical and mental coordination for the hollistic development . The school counsellor Mrs Simran K. Dhillon presided over the workshop for the students of class 10th .The workshop aimed to discuss topics related to child right ,self empowerment,Juvenile Justice Act( 2015) with its key principles POCSO Act,child abuse and online security .These issues currently envelope the students in the present scenario of their questionable security everywhere; thus ,each issue was discussed and examplified by practical instances that the students experience everyday .All in all the workshop ended on a positive note. Capacity building workshop for Pre-Primary Classes was held in DAV 15 Chandigarh to hone the teaching skills of Pre Primary teachers .Approximately 40 teachers from DAV Schools of Tricity wholeheartedly participated in the workshop. The workshop was inaugurated by Cluster Head, Mrs Jaskiran Herika, Mrs Anuja Sharma and all the Principals of DAV Tricity Schools. Principal ,Mrs Anuja Sharma welcomed all present and highlighted the need to teach tiny tots in a playway method for their holistic development. The workshop was an interactive session in which the Master Trainers ,Ms Mala, Ms Geeta from DAV8 Chandigarh, Ms Ruchika and Ms Anita from K.B. DAV. Public School, Sector 7 ,Chandigarh and Ms Neena Sood from DAV Model School, Sector 15 ,Chandigarh apprised the teachers about various strategies and methodology for efficient teaching of tiny tots. The trainers showcased different techniques to chisel listening, reading, writing and speaking skills with the aid of concrete objects, structured conversations and the importance of conducting assembly to hone the creative potentialities of the children thereby instilling their confidence .Checklist Evaluation Activities were also conducted in which the teachers wholeheartedly participated. The workshop opened new horizons of effective teaching. To increase students’ awareness about child sexual abuse ‘Shout and Stop’ workshop was organized on 23rd August 2017 for students of classes III to VII by the School Counselling Cell in collaboration with Chandigarh Commission for Protection of Child Rights (CCPCR). Ms. Pratibha Bhandari and Mr. Ishaan Dogra, members of the Legal Panel of Child Welfare Committee apprised the students about The POCSO Act which deals with protection of children against sexual offences. Ms. Vrinda Sharma, Counsellor Women and Child Helpline increased awareness of students about how to seek help through the Women and Child Helpline of 181 and Child Helpline of 1098. Ms. Niti Mohan, POCSO Consultant of CCPCR explained about Good Touch and Bad Touch by screening ‘Komal’ a film recommended by CBSE and a film on Safety Lessons for children. The concept of ‘Circle of Love’ that deals with who can touch a child was explained to the children and a quiz based on child safety was also organized. Mrs. Anuja Sharma, Principal DAV Model School Sector 15 A, Chd. emphasized upon the importance of child sexual awareness as the need of the hour. The workshop was attended by five students of XI (Arts) and Mrs. Simran K. Dhillon (School Counsellor). Various risk taking activities which adolescents indulge in eg. smoking, alcohol, drug abuse, bunking, hiding whereabouts from parents, underage driving, careless use of social media, cheating etc. were discussed. Their possible causes like observation of parents, seniors and media, exploration, curiosity and thrill seeking, need to fit in and belong, illusion of invulnerability and ignoring long term consequences, desire to rebel, peer pressure and fear of disagreeing, stress, failures, fights and break-ups were also highlighted. Students were informed about the various consequences of risk taking behaviour which could be physical harm to self or others (immediate or long term), guilt or regret, low self-esteem, high cost, further involvement to riskier behaviours, academic, social, or professional decline. At the end students were also apprised about the possible solutions for risk behaviour management which has the following steps, Self-Awareness, Evaluating Risk, Express yourself Assertively, Find safer alternate options. In continuation with the efforts to hone listening, speaking and pre-writing skills, DAV 15 organised a special workshop for parents of Nursery class students. It was an initiative undertaken by the school to spread awareness about the right way to coordinate motor skills of the tiny tots. Principal Mrs Anuja Sharma motivated the parents to spend quality time with their children and participate in creative activities with them to ensure their holistic development. She highlighted the need of this interaction to complete the triangular interaction of parent-teacher-child needed as an essential pre-requisite to chisel the creative potentialities of their children. A plethora of activities were organised for the parents to enhance the sensitivity of the parents towards the development of fine motor skills along with hand and eye coordination. They actively participated in activities like paper crunch, clay modelling, pebble painting, brush painting and straw fixing on a brush. The workshop was a great peep into innovative methodology adopted by the teachers of DAV15 to nurture motor coordination for fine writing skills of the tiny tots. 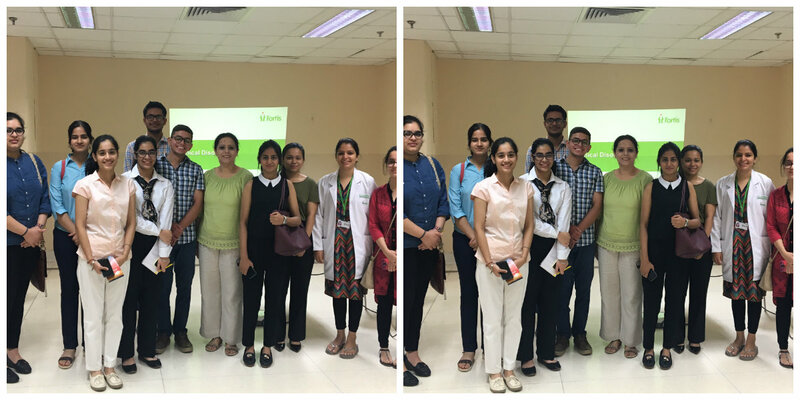 Department of Mental Health and Behavioural Sciences, Fortis Hospital, Mohali organised an Internship Programme from 1st June 2017 to 7th June 2017. Nine students DAV Model School of class XII (Psychology) attended the internship programme. The internship programme commenced with academic classes orienting students to clinical disorders and psychotherapy. Students were also exposed to techniques of psychological interviewing, experiential learning on understanding the self. They were introduced to areas of super-specialization within the field of Psychology including Sports Psychology, Psycho-oncology, Organizational Psychology and Art Therapy, Observation of counseling process of patients, Simulation of client/patient situations. The internship concluded with preparation of project on case study. DAV 15 constantly endeavours to update parents by involving them in the development process of their wards. In continuation with these efforts to accentuate holistic development of children ,the school organised an interactive workshop for the parents . The theme of the workshop was development of “ Fine Motor Skills in Pre- Primary Classes”. 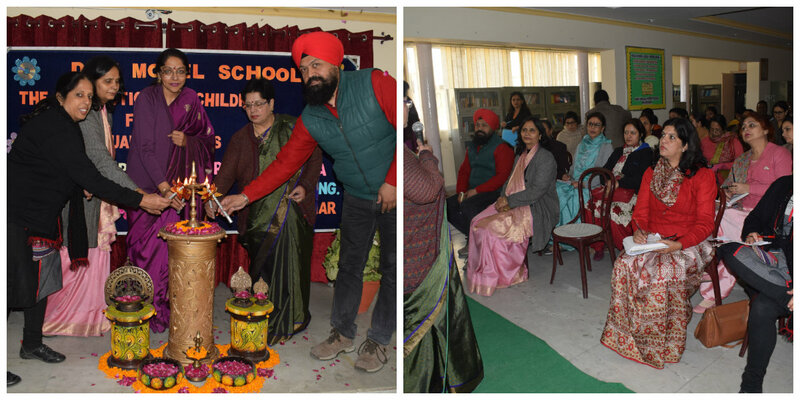 Regional Director, DAV Schools Shimla, Ms.Sofat inaugurated the workshop & applauded the interaction of teachers & the parents in the unique educational activities Principal , Mrs Anuja Sharma highlighted the need to chisel listening, speaking , and pre-writing skills for developing sensory, motor skills through playway method .She congratulated all the teachers and parents for their whole hearted participation. A plethora of activities were organised for parents which were thoroughly enjoyed by them .They enthusiastically participated in activities like Brush Painting ,Tearing and Pasting, Threading the button Clay modelling, Colouring with crayons , Card embroidery and paper folding. Chocolates and huge rounds of applause motivated the parents to excel in these activities. The workshop was an eye- opener for all the parents to help them nurture and hone the creative potentialities of their tiny- tots. A two-day workshop on `understanding classroom management’ was organised in the portals of DAV-15, Chandigarh by the Principal Mrs. Anuja Sharma. 65 teachers participated with lot of enthusiasm and vibrancy. There was wonderful interaction and exchange of ideas, motivating expressions and feedback. Various components of effective classroom management were explained by incorporating various handouts discussion and active participation of groups. Teaching styles were discussed at length by actively taking feedback by teachers, classroom organisation and classroom discipline were also considered as inseparable parts of classroom management. The workshop was an innovative approach to teaching and learning process by using different strategies, principles and methods for holistic development of students. ‘Training of Teachers on Managing Online Lab Resources ‘ was conducted by CBSE on November 1, 2016 at DAV Model School, Sector 15-A, Chandigarh. Honourable Mr. Chander Shekhar , Project associate of Amrita University, Kerala trained 27 teachers who have come all the way representing various schools from Haryana , Punjab , Himachal Pradesh and Chandigarh. Since the Department of Electronics and Information Technology is ‘ funding the project on ‘Rollout of Olabs’ , CBSE has taken the noble initiative to make teachers fully equipped to use and manage Olab Resources for the benefit of students. Mr. Chander shekhar enlightened the gathering with the Olab content that has been developed for classes IX- XII for Physics , Chemistry and Biology. Also it is available in Mathematics and English for secondary classes. He introduced the participants to the features of online labs which will provide the students experience of virtual experiments that will stimulate them to do real lab work. He recommended olabs to all the schools. Very Enthusiastically , the teachers tried their hands on computers to gain practical knowledge. The workshop was a grand success. A Hindi Workshop was conducted in DAV MODEL SCHOOL SECTOR 15 Chandigarh on 23rd Sept 2016 based on the Uniform Pattern of Marking as Per Marking Scheme of Class 8 Hindi Question Paper. It was organised under the aegis of DAV Centre of Academic Excellence and the able guidance of Regional Director, Mrs. Madhu Behl and Co-ordinator Mrs. Jaskiran Harika. Principal Mrs Anuja Sharma welcomed all the teachers and motivated them for their valuable input for the upliftment of standard of education. 47 teachers from Panchkula, Kurukshetra and Chandigarh attended the workshop. The Resource persons were Mrs. Archna Malhotra from KBDAV, Sec-7,Chd. and Mrs. Rupa Thakur from DAV Model School, Sec-15 A,Chd. They apprised the teachers about the latest marking scheme and uniform evaluation of question papers. The teachers actively participated and exchanged their views and queries. Later same answer sheet was given to the teachers to reach the unanimous evaluation and minimize the variations in marking of various answers for the benefit of students. 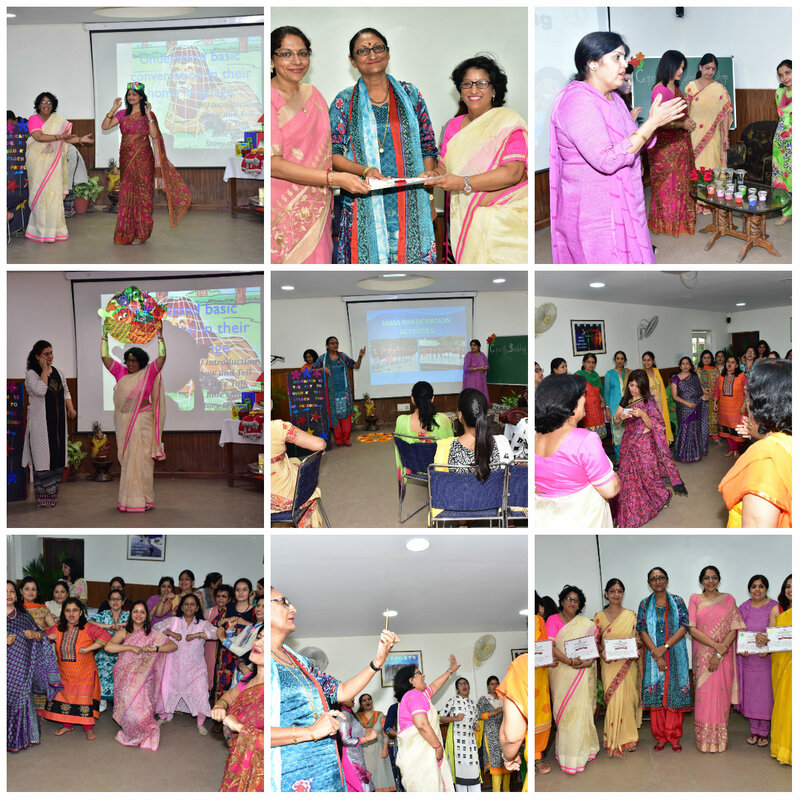 Language Teaching Enhancement Workshop on Creative Teaching in classroom for Language Teachers was conducted in DAV 15 on 10th Sept. 2016 by Dr. prof.Deepti Gupta, Dean Foreign studies , Punjab University,Chandigarh. The Principal Mrs. Anuja Sharma thanked Dr. Deepti for taking out her valuable time to impart her knowledge to enrich teachers with new perspective of teaching language creatively in the classroom. All the Language Teachers of the School enthusiastically participated by giving their ACTIVE OUTPUT to the learning INPUT given by the Resource Person. Many interactive activities were taken up to motivate and reinforce the teachers to ‘Think out of the Box’ and relate their teaching to presentation of lessons in the class through the medium of songs and stories. The workshop ended with learning of an innovation approach towards teaching language in the classroom. A two day interactive session was conducted on 1st and 2nd July 2016 in the portals of DAV 15, Chd. for the teachers on the topic, ‘Transacting life skills’. The Teachers were appraised about the importance of usage of life skills efficiently in classroom teaching and preparing lesson plan. Various strategies to de-stress and coordinate work with overall well-being were discussed. Appreciation cards were given to applaud their active participation. Many activities such as Yoga, role-play enactment, group presentation and power point presentation were enthusiastically attended by the 60 participants. Teachers felt enriched by this new vision of knowledge transacted by Principal Mrs. Anuja Sharma and Dr. Lalita Nandel. The exercise will help the teachers to reach out to the students to become better humans. One day workshop for Science Teacher’s for Class 9th and 10th was held at DAV Model School, Sector-15 A, Chandigarh. Thirty Two Teachers from whereas school was attended the workshop. Professor K.K. Bhasin (Dept. of Chemistry). Professor Manjit Kaur(Dept. of physics) , Professor Neelima R. Kumar( Dept. of zoology) and Dr. Daizy R. Batish (Dept. of Botany) were resource persons from Panjab University, Chandigarh who entitled the Teacher’s on whereas topics like- Physics in day today life, importance of some compounds and elements , economically important insects and conservation of Biodiversity . It was an interactive session and the teachers were highly motivated. Professor K.N. Pathak (Ex- V.C., P.U., Chandigarh) President NASI, Chandigarh Chapter ask the teachers to make there classrooms more interactive and arouse the curiosity of the students by making them ask questions. Principal of the School Mrs. Anuja Sharma lauded the initiative taken by NASI for popularizing science and organizing this workshop. The school organized a two day workshop on 21.11.2015 and 22.11.2015 to enable the students of senior secondary classes for performance enhancement in the subjects of Economics, Accountancy and Business study the Commerce group. The delegates were from various DAV schools of Punjab, Haryana and Chandigarh. The day began with an inaugural ceremony by the regional director Mrs Madhu Bahl and a cordial welcome was accorded by the Principal of host school Mrs Anuja Sharma. It was very informative and educative workshop keeping in mind the students to achieve performance enhancement with the said methods. The main thrust was on concept mapping in all the three subjects for important topics to help average and slow learners. The resource persons were from various DAV schools. The purpose of the workshop was to make the delegates aware of changes in curriculum, and question paper of CBSE in the three subjects. The strategies for slow learners were designed for all the three subjects. The teachers /delegates also formed work sheets for weak students. Typology of question paper was discussed in terms of CBSE patterns as HOTS, application, learning that would come in board exam. In the subject of Business study value based questions were discussed that what values are taught and what are ignored in the market. 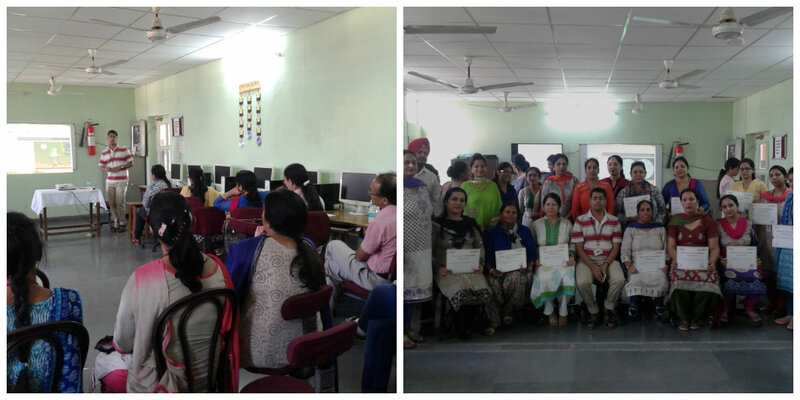 A two day workshop on importance of ICT and Technology integration in curriculum started in DAV Model School, sector-15 A, Chandigarh on 20-05-2015. The workshop was attended by primary and secondary teachers of DAV Public Schools of HP Zone-V, Ambala Zone, Panchkula Zone and tricity schools. After the ritual lamp lighting and welcome address by Principal of the school, Dr. (Mrs.) Rakesh Sachdeva, the session began. One of the resource person, Ms. Aruna Ahuja familiarised the teachers with importance of ICT in classroom. DR.(Mrs.) Rakesh Sachdeva motivated the teachers to become technology savvy and remain 2 steps ahead of students. The teachers were apprised with Hot Potato Software an application suite to develop multiple choices, short answers, fill in blanks, match the following and puzzles. The workshop also aimed at making classroom teaching more interactive by using Edmodo, an educational website and use of blogs. The resource persons were Ms. Aruna Ahuja, Ms. Amar Jyoti, Ms. Rimple Swami, Ms. Deepti Sharma and Abhishek Sharma. Mrs. Madhu Behl, Regional director and training Coordinator of DAV Centre for academic excellence, DAVCMC addressed the gathering encouraged the teachers make maximum use of technology. She expressed satisfaction over the organisation and progress of the workshop.